Title: Lapita face sherd. 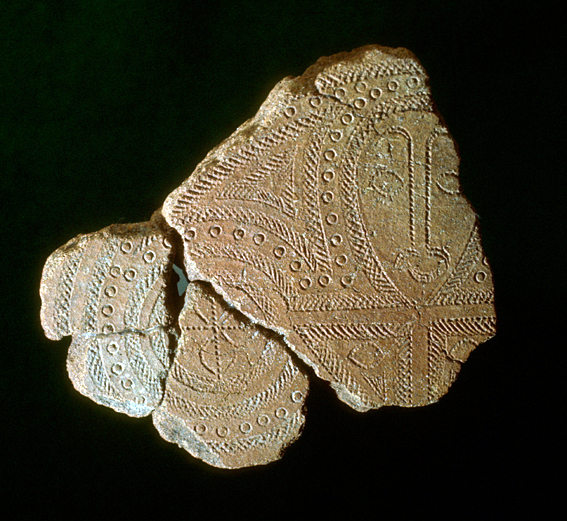 Discovered at the Nenumbo site in the Solomon Islands in the 1970's by a University of Auckland researcher this fragment measuring 3 inches across is thought to date back to 1000 BC. It depicts the face of the Lapita culture, an ancient sea-faring peoples thought to be the common ancestor of the contemporary cultures of Polynesia, Micronesia, and some areas of Melanesia. Reference: Green, R.C. 1976. Lapita Sites in the Santa Cruz Group. In. R.C. Green and M.M. Cresswell (eds) Southeast Solomon Islands Cultural History: a Preliminary Survey, pp. 245-65. Wellington: Royal Society of New Zealand Bull. 11, Green, R.C. 1978. New Sites with Lapita Pottery and their implications for an understanding of the settlement of the Western Pacific. Working Papers in Anthropology, Archaeology, Linguistics and Maori Studies. 51.Department of Anthropology, University of Auckland. 30 pp.